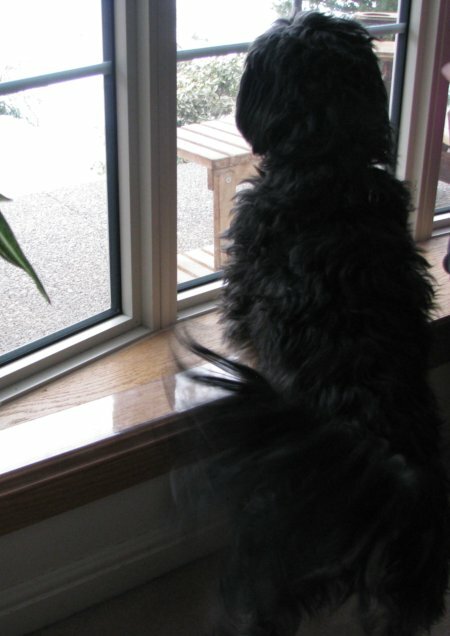 Dogs scratching your doors and window sills ? Dogs scratching your sills and doors ? Dogs scratching sills and doors, your furniture and floors can get expensive. 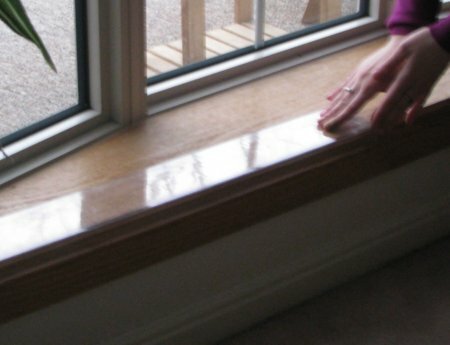 Its good to take some protective steps to keep your wooden surfaces looking good no matter how excited your pets might get when birds or squirrels land in front of the window. 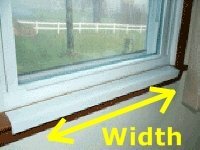 One easy method is to have plastic guards cut to fit window sills and doors. This can be done with plastic panels bought from from the hardware store. There are also commercially available sill guards made from polycarbonate plastic. (The same material they make hockey face shields from) The hard plastic resists scratching and protects the surfaces behind it from the strongest claws. Sill guards also have one side bent at a 90 degree angle so they wrap around the edge of the window sill, protecting the whole surface. The sill guards are secured with velcro pads which allow the gaurds to be removed for cleaning but hold the guards on tight enough so the pet scratching wont knock them off. The are also guards made to fit over doors including screen doors. The screen door may need to protected from both sides so in those cases 2 guards may be needed. The same material is available in different sizes for door guards. There are also guards made to fit over doors including screen doors. The screen door may need to protected from both sides so in those cases 2 guards may be needed. There are various kinds of pet guard on the market. 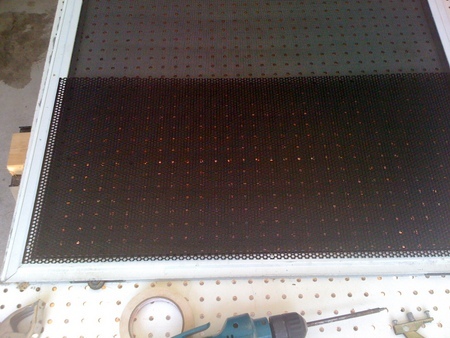 Most are made from heavy expanded steel mesh that you attach to the patio screen door using screws. Although these do protect against dogs scratching, one of the drawbacks of steel guards is that they are heavy, they make the door harder to slide across and wear out the rollers faster. You can also use plexiglas or acrylic but in order to get strong enough protection from dogs scratching at it you need 3/16" thick material or more. That again makes the weight go up. I have found one of the better materials is perforated epoxy coated aluminum sheet. This material is strong enough to resist the scratching from even big dogs, but it is light enough that even a 30 inch tall guard wont weigh down the door. The Black epoxy coating resists the weather and makes it blend in with the screen cloth. 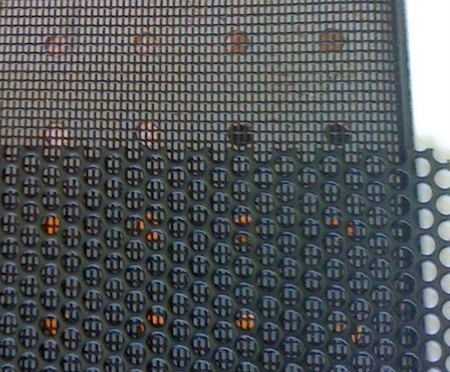 Another nice thing about perforated aluminum is that its already full of holes ! 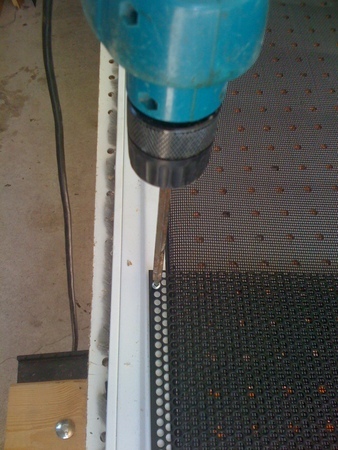 That means you can use those holes for screws to attach the material to your screen door frame. 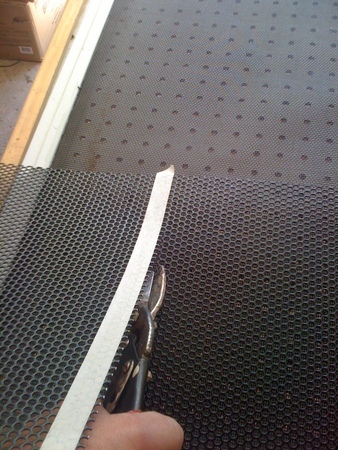 The 0.040" thick aluminum is thin enough to be cut using tin snips. 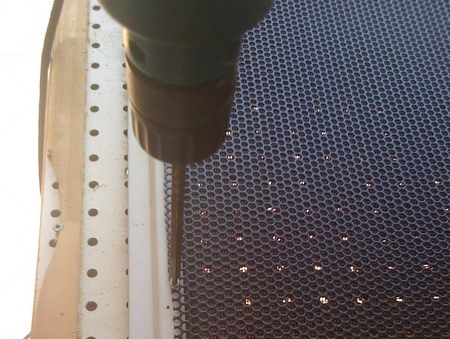 The regular lines of holes make it easy to cut a perfectly straight line when trimming the material. Its best to mark a line using masking tape though because the masking tape makes it easy to see the line. I'm not wearing work gloves in this picture but you should as it is possible to scratch yourself on the fresh cut edges of the perforated metal. The best screws to use to attach the guard are #8 x 1/2" long 18-8 stainless steel sheet metal screws. 18-8 is a grade of stainless steel commonly used for screws, nuts and bolts. Having stainless steel screws means that they will never rust. The sheet metal screws have a drill point which allows you to screw them into the screen door frame with hardly any force at all. Im using a 20 year old regular plug in the wall 3/8" chuck makita regular variable speed drill and all it takes is the lightest touch to put the screws in. In fact you can spin them in the hole if you go too fast. The finished guard blends in really well with the black fiberglass screening. If you have problems with dogs scratching your screens and need more information about where to find the perforated aluminum material, please contact me at the email address or phone number shown on the home page.